Comparing the statistics of the Earth's population numbers in 1800 with those in 2008, we can easily notice the immense rise of people inhabiting the Earth. This fact has resulted in overpopoulation: the state in which the average number of humans living on our planet is no longer sustainable. With regard to the repercussions of overpopulation, they can only be adverse for humanity. However, how could something be done, so as to control the increase of population, but simultaneously not violating human rights? To begin with, many of us would wonder why such a large population should be considered to constitute a problem since it has provided humanity eith a suitably large workforce. 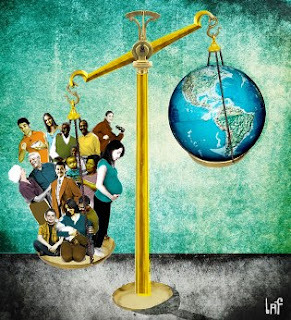 Nevertheless, the ratio of people residing on Earth to those that can be sustained by our planet, is disproportionate. Were this problem to worsen, there would be a huge crisis of food deficiency. Concerning the need to satisfy the vital necessityof nourishment, food supplies will not be enough to meet the needs of such a huge number of people. As a result, there may be a war on food and many people might die of starvation, Moreover, another unfavourable aspect of overpopulation is that life standards are going to be downgraded, due to the thickly populated areas, in which people will be crowded, dropping litter and dispose sewage. Rarely will we pass through clean streets and roads. To make matters worse, what is distressing is that people not having a shelter, will live even in landfills, owing to the fact that there might not be any space to build a house. Maybe overpopulation does constitute a huge problem for humanity, but would the effort of limiting this be sensible? To alleviate the situation, the goverment should create a benefit especially for families with only one child, or make electricity less expensive for them. In this way, financial incentives are going to be given and many people will be motivated to bring up one child. Furthermore, it is vitally signifcant that a campaign is launched to raise awareness of the crisis. For instance, people can be informed about contraceptionand how disastrous overpopulation can be for their lives. Under no circumstances should we let people be unaware of this serious situation. Taking these steps means that we make an effort to overcome the problem, without infringing upon human rights. All in all, I am inclined to believe that with the proper steps, solutions can be fond. It would be wiser to inform the public and to take action for solving this global issue, so long as human rights are not violated.